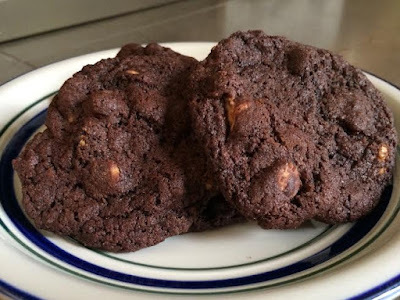 I make chocolate chip cookies so often with the kids that it is a real mystery why they are not listed anywhere on this blog. We make them at least monthly and there is always a supply in our freezer. This is precisely why I wanted to change it up the other day when we were contemplating making some cookies to send with my husband on a roadtrip. I was craving a brownies too. Like the BEST brownies I have talked about in the past here on this blog. Those are almost all done on the stovetop though, and my daughter was anxious to help. I wanted to come up with a cookie that kind of tasted like a brownie, but with a chocolate chip component. That was my intent..... but then I found some peanut butter chips in my cupboard and that idea went out the window. So, behold: A brownie-like cookie, bursting with peanut butter chips! I've gotta tweak them a bit to make them chewier, but in the meantime, these will NOT disappoint. Cream butter and shortening together until light and fluffy. Add sugar and vanilla and continue creaming thoroughly. Add eggs, one at a time, and beat until smooth and fluffy. Combine flour, cocoa, baking soda and salt together in a medium sized bowl. Add gradually to creamed mixture. Stir in the peanut butter chips. Drop by teaspoons onto parchment lined cookie sheets and bake in a 350F oven for approximately 12 minutes. Do not overbake, or they will be too crispy. I like a chewier cookie. When you remove these from the oven, allow the cookies to firm up slightly on the pan before transferring to wire racks to cool. Enjoy!